Seven months ago I got married and at that moment I went from having three wonderful parents to having eight! Blended families are pretty much the norm these days, but I think my husband and I take this to a whole new level. I didn’t know it yet, but at that moment birthdays went from a weekend event to a month long celebration. All I can say is – I am not complaining! I think it’s safe to say I chose well, because the food disappeared in about 2.5 minutes flat. My personal favorites were the appenzeller cheese (perfectly firm and creamy swiss style cow cheese), the bison smokies, and the pretzel with honey mustard (plus it was in the shape of an ampersand – how cute is that??). It was clear that the asparagus had been pickled using fennel, which is kind of unfortunate, as most of the table really dislikes the black licorice flavor it gives. But, overall a huge win. The “Butcher’s Pride” feature was a meatloaf made with 90% bison and 10% beef, served with tricolor baby potatoes and kale. The “Captain’s Catch” feature was a seafoood green curry with scallops, shrimp, mussels and salmon over coconut rice. I instantly knew what I was going to order – I am a sucker for green curry! Between the five of us, we ordered two of the “Captain’s Catch”, two of the “Butcher’s Pride” and one Organic Free Range Chicken (Apple Hickory Smoke, Honey, Herbs, Little Gems and Vegetables). I would definitely recommend Ampersand 27 as a place to meet friends for cocktails and charcuterie or to go for dinner on a special occasion. The service was amazing and the decor is absolutely beautiful. Check it out! Over the past summer I have had the opportunity to spend many Saturdays at the Farmer’s Market and it has really opened my eyes to availability and seasonality of foods. When you shop at the grocery store you see the same fruit and vegetables stocking the aisles nearly every month of the year but at the Farmer’s Market you see exactly when food is available and at it’s peak – because if it’s not, you probably won’t be able to find it. I’ve also found that if you are looking for something a little bit more unique you likely won’t find it at Superstore or Save On but you can almost always find it at the City Market on 104 Street! Anyways, I found a recipe for Chicken Milanese with Celery Root Puree on the Canadian Living website and I was excited to try it out (after looking at three different grocery stores for celery root and finally finding it at the Farmer’s Market). Chicken Milanese is a Latin American dish where breaded meat fillet preparations are known as a milanesa. I lightened this one up by baking the chicken rather than frying it and getting rid of the cream in the puree and substituting milk instead. This would be a great dish to make for friends because it is delicious, not overly adventurous for those picky eaters and looks beautiful! Sprinkle chicken with salt and pepper. Place flour in shallow dish. In separate shallow dish, whisk egg with mustard. Place panko in third shallow dish. Dip chicken into flour, shaking off excess; dip into egg mixture, letting excess drip back into dish. Press into panko to coat. Place on waxed paper–lined rimmed baking sheet; refrigerate for 10 minutes. Using an olive oil mister or cooking spray, lightly coat baking sheet. Place breaded chicken on sheet and lightly coat chicken (to get a nice golden crust). Bake for 15 minutes or until inside is no longer pink. 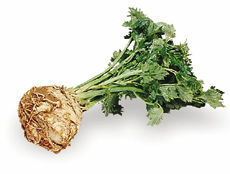 Celery Root Purée: Meanwhile, in large pot of boiling water, cook celery root, potato and garlic until tender, 12 to 15 minutes. Drain; return to pot. Dry over low heat, shaking pan often, for 1 minute. Transfer to food processor; add Gruyère cheese, milk, margarine, salt and pepper. Purée until smooth. In bowl, whisk olive oil with lemon juice toss with arugula and celery root leaves. 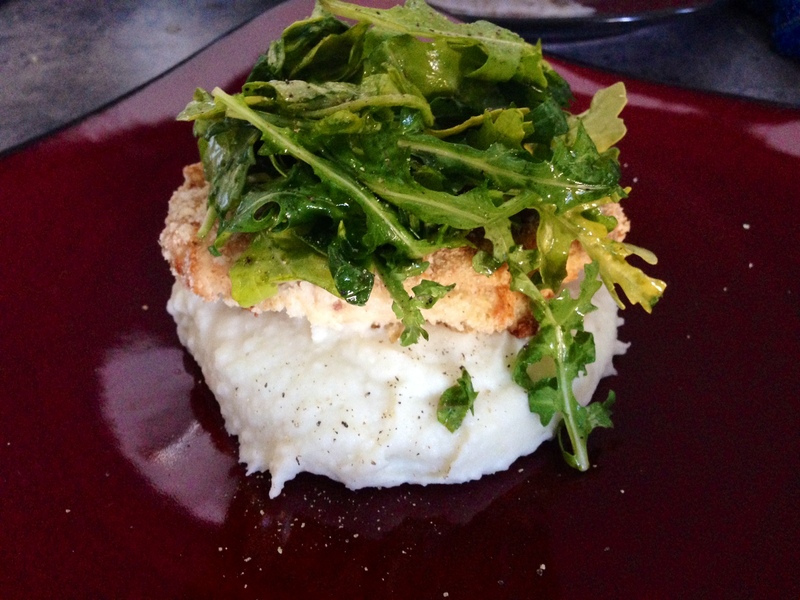 Serve over chicken and celery root purée.